Bacon lovers… you’re killing me, here. Bacon is, without question, the candy of the meats. Not only is it delicious but that tasty pig flesh is pliable enough to slip into almost anything, from donuts toedible candles. There was even a beer that tasted like it! But what about when you just want the taste of bacon without all of the calories or the hard work of actually eating? Enter BaconAir. 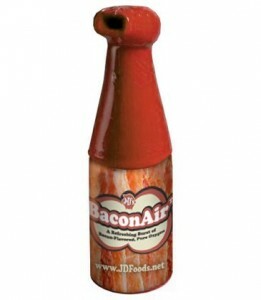 Did we mention it was kosher?The $8.99 “bacon-flavored oxygen inhaler” comes from Seattle-based J&D’s, which has made something of a name for itself over the past three years with their bacon-flavored, vegetarian-friendly, kosher products like BaconSalt, Baconnaise, Bacon Pop (as in pop corn), bacon-flavored envelopes, bacon lip balm and, wait for it, Bacon Baby (as in bacon-flavored instant baby formula). We aren’t making any of this up. But this latest product, which they claim to have been working on for two years, clearly ups the ante—they go so far as to call it “bacon 3.0.” Because what else would you call a bottle of “no calorie, fat or stimulant” oxygen that tastes like pig? Flavored air. Think about that for a minute. Flavored. Air. Flavored… air… that you buy. Flatline______________________D.O.N.E.! This truly is a Weekend Monday thru Friday WTF????? This reminds me of the air bar they had in the mall a few years back. It blows my mind that people will pay their hard earned money on something this ridiculous. Okay now this is just ridiculous. I ain’t gone lie, I like bacon, but that only (Sorry Erika, it is what it is…LOL) but all this bacon extra is just nasty. I mean come on …DANG!!! I don’t know what to say…shm. I can kinda see the appeal behind this. If you’re craving bacon really badly you can take a whiff on your bacon-inhaler instead of eating the real thing and getting all the fat and calories that comes with it….. Although, to be honest that sort of treat substitution never works with me. I’d probably still go out and buy a bacon cheeseburger afterward! This is my first actual laugh for the day and its 6 mins to 11 lmao wow bacon flavored air. There can be nothing more!